The AAPK image gallery contains 6820 pictures for your viewing pleasure. 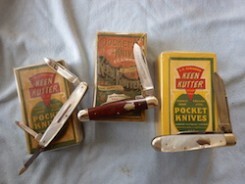 This forum is dedicated to the discussion and display of old knives. The rich history of all the many companies that made them through the early years will be found here as well as many fine examples of the cutlers art. Share pictures of your old knives and your knowledge here! Found this knife 25 years ago, hardly used someone did hone the edge to sharpen it. Otherwise it is very clean with the original blade polish. If the blade was not stamped I would have thought it was just another pruning knife. Never researched it much but I did know it was for cutting linoleum because of the blade stamp. Most of them are fixed blade knives not folders. At the 2002 Conference of the Association for Industrial Archaeology delegates were taken on a visit to the Forbo-Nairn Linoleum works at Kirkaldy. Linoleum is now sold as ‘Marmoleum’ but it is nevertheless a traditional product and, apart from the computer control, is made in much the same way in Kirkaldy as it was over a century ago. The Linoleum made there is plain – apart from the odd random swirly pattern produced through the colour mixing process. Some ‘inlaid’ linoleum is produced laboriously by hand – and we saw women making up mosaic patterns by hand. For me, this was a revelation, since some of the research I had done on the industries of the Greenwich Peninsula had shown me that ‘inlaid’ lineoleum had been made by machine over a hundred years ago. There are various stories told about the Greenwich Linoleum factory – it was the biggest, it was the first.. I had not expected to find Lino manufacture on the Greenwich riverside at all and even wondered if the factory was ‘just one of those legends’ after I had tried, and failed, to find anyone local who had worked there or indeed knew anything about it. It took a journey to Scotland to find out anything much about it – and the discovery that there were in fact two linoleum factories in what is today the shadow of the Millennium Dome. Linoleum was the universal floor covering of the Victorians, although it enjoys a rather down-market image today. Oil-based floor coverings had evolved during the course of the nineteenth century and linoleum factories had begun to replace the many floor cloth factories which had provided coverings for early nineteenth- century floors – the Greenwich kampulticon factory was well known. Linoleum manufacture was the brainchild of one man – Frederick Walton who came from near Manchester. Walton was probably one of the most prolific and influential inventors and industrialists of the late Victorian era. Many of his activities – in particular some his international links – would well repay investiga tion. Walton himself coined the word ‘linoleum’ from ‘linus’, flax and oleum, oil because it was made of linseed oil on a base of woven jute. When I got home from the AIA Conference in 2002 a friend proudly showed me her new bathroom floor covering – ‘Walton brand marmoleum’ . Walton was the son of an inventor and he grew up to be an inventor himself. His father, James Walton, a philanthropist and inventor, had developed an India rubber wire card which was used in the weaving industry. The family’s factory was at Haughton Dale near Hyde in Greater Manchester. It was the largest works of its kind in the world. In the family tradition Frederick Walton began by developing a number of projects and is said to have already held seven patents by the age of twenty-five. One of the things which he noticed was oxidised oil – the skin on top of paint – when he worked on an attempt to find a quick-drying varnish. When this project failed he set about looking to find a use for this skin. At first he tried it as a substitute for rubber but soon moved onto to other ideas.. He left his father’s wire card business he and went to seek his fortune in London. His father refused him any help with this new venture, but with Smilesian determination he continued. He found that his new material could be rolled out onto a suitable backing – using linseed oil and cork – and thus linoleum was invented. Walton’s first factory was in Chiswick in 1861, and he later moved to a bigger works at Staines. The Staines factory became famous and proved long-lasting – in terms of the acreage covered it seems to have been almost as big as Staines itself! Some buildings remained on site until relatively recently and the excellent Spelthorne Museum in Staines has an exhibit about the works – a factory of which the town was very proud. Walton himself soon moved on to bigger things and by the early 1870s had set up an American factory at ‘Linoleumville’ on Staten Island. He also developed Lincrusta wall covering – another ubiquitous Victorian and Edwardian furnishing medium. He set up his Lincrusta factory in Sunbury-on-Thames, as well as others in France and Germany. He is also said to have been the originator of OK meat sauce. The Staines works was independent of Walton and he seems to have quarreled with them. Although he had left them to develop Lincrusta when he began to work on a new sort of linoleum he offered the process to them, and was turned down. He determined to go somewhere else with the machine that he had designed to make inlaid, or mosaic, linoleum. One clue where he went is can found on an advertisement for another of his projects which the manufacture of flexible metal tubing – he had purchased the patent from a French inventor. An advertisement card for this tubing shows an aerial view of the company’s ‘Greenwich Works’. This site has not been identified as matching any similar works on the Greenwich riverside and it probably shows the Appleby Works at what is now Victoria Deep Water Wharf – currently being developed as an aggregate works. Walton was to acquire this site. Walton may also have had other connections with Greenwich in that it is said that one of his developments concerned a covering for telegraph cables which was, and is, a major industry in the area. He is also said to have worked for Brin Brothers who founded British Oxygen and they also were to open a Greenwich factory at the southern end of the Greenwich Peninsula. Walton took out a lease on Victoria Wharf which had previously been home to factories owned by Bessemer and then Appleby Brothers. He was very proud of the site’s connection with Henry Bessemer and announced in his publicity material that it was where Bessemer had evolved his steel-making process. It was also said that some original Bessemer steel bars were incorporated in the factory gate in Blackwall Lane. It should perhaps be noted that the Science Museum has a piece of steel which is said to be the first steel produced by a Bessemer converter and that their records say that this came from Greenwich – although this cannot be proved and is generally disbelieved. Soon after starting a second works was built at Greenwich slightly to the north – part of Bethel’s Wharf was used, although the date of the expansion is not clear. By 1910 the works was immense – making about twenty miles of linoleum each week – a year’s output would have stretched to Warsaw! The lino was made from a mixture of cork, oils and colouring. Each sheet was made of tens of thousands of tiny pieces, made up in an original pattern into a template by specialist craftsmen. These sheets were then cut and welded into the different designs. There were three of these gigantic machines at Greenwich and it did not prove easy to build foundations for them in the marshy sub-soil – Walton said the cost of the work to stabilize the ground was more than that for the machines themselves. Linoleum was made from finely-ground cork waste, resins and guns and oxidized linseed oil, plus colouring matter. Materials came from all over the world. Cork came from Spain and Portugal. Jute came from India to be processed in Scotland. Linseed oil came from South America and the United States. Nearby was Greig’s Seed Crushing Mill and it is a matter of speculation as to whether it had anything to do with Walton? It slightly predates the lino works but Greig’s were well known floorcloth manufacturers in the Dundee area and it is possible there was a connection. Linoleum could not help but be a success. A hundred years ago its practicalities were appreciated. It was durable, sturdy and clean and could be produced in all sorts of designs. It was even said to have germicidal properties. In each sheet of geometrically patterned linoleum were tens of thousands of little squares united and cemented together in any variation as required. The final machine could put together six linoleum pieces in six colours entirely automatically. This machine was so big that it could not all be seen in one glance. It weighed 400 tons and was in a building 50 feet high It consisted of a huge cylinder of 18 feet diameter and weighing 20 tons. Six sheets of differently coloured linoleum were fed into the machine delivered to different points of the drum. Each colour of linoleum had its own cylinder where it was cut to a template produced to a thousandth of an inch accuracy – and could include shapes other than mere squares. The quality of work and the machinery was said to be high since the factory employed men trained at Woolwich Arsenal. There is a great vagueness in the accounts I have seen of the next stage of the process but eventually the patterned linoleum emerged pressed into the desired pattern as a continuous sheet. The factory produced a booklet describing the whole process – I have never seen this and would be interested if anyone could produce a copy. Walton died in his nineties in 1921 following a car accident at Nice in the South of France. In his later years he had spent much of his time in pursuit of psychic phenomena. His business interests were many and he was a very rich man. The Greenwich Inlaid Lino works had been closed for a while during the First World War because, it is said, most of their workmen went to earn better money at Woolwich Arsenal. After resuming work in the 1920s, the finances of the company became very insecure and the then Managing Director, Mr Mackie, went to Mr Greig at the Newburg Floorcloth works, near Dundee, to offer to do a deal with him. This was refused. The company was eventually taken over by Michael Nairn of Kirkaldy – to some dissent. In April 1922, when the merger was announced to the Greenwich share- holders, a big meeting was held. Mr Mackay, who had been manager of the company for the previous eighteen years, pointed out that it was only during his time as manager of the company that it had paid a dividend. Other protestors were ‘howled down’. The problem with the Greenwich works, it was said, was that it only had one product – the inlaid linoleum. Michael Nairn and Co. did not make this but made a wide range of related floor coverings. Although a merger seemed sensible it was in fact a takeover since Nairn’s was a much bigger company. Nairn’s kept the Greenwich factory working through the 1920s and in 1926 the Duke of York, the future George VI, visited. The factory was then very prosperous and he toured it, wearing overalls, inspected the process and met men who, as boys, had attended the summer camps which he sponsored. Greenwich Linoleum was of the standard geometrical patterns fashionable at the time. Some specialist lino was also made – some for Lyons teashops with the Lyons name specially implanted in it. One of the vast machines was moved to Kirkaldy from Greenwichand installed there in the ‘North Factory’. It was this factory which we saw on the AIA visit in 2002 but our guide knew nothing of the Greenwich machinery – or indeed of the process which produced the ‘inlaid’ linoleum now being made by hand. Although Greenwich lino went out of fashion its shapes and designs look set to make a comeback – it is interesting to see that in America Lincrusta is already popular again. Forbo Nairn’s ‘Walton’ and ‘Marmoleum’ ranges stress the natural products used – linseed and hessian – and the traditional designs. Linoleum is, they say, an environmentally friendly product – clean and natural – an interesting contrast to its high-tech sales pitch a hundred years ago. Perhaps eventually Walton’s machinery will be reinvented and we will see intricate Victorian designs made once more in linoleum. Very interesting Dimitri, along with a beautiful knife, thanks!!! Nice knife, Dimitri! I certainly would have mistaken it for a pruner. Very interesting article as well, my learned something new for today.